"You complained, Toshiba listened. After its Thrive tablets were widely panned for their short battery life and chunky, cheap-feeling design, the outfit decided to put those models out to pasture and start anew. So bid goodbye to the Thrives, then, and say hello to the Excite 7.7, 10 and 13 (yes, 13). If you've been paying attention, these are the same tablets we first saw in prototype form at CES (and again at Mobile World Congress), complete with their slim builds and textured aluminum backs." 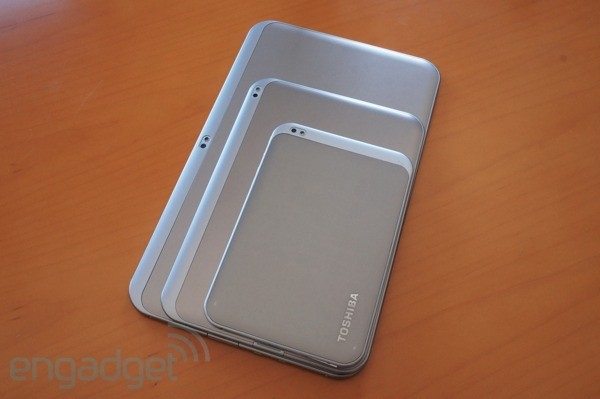 Interesting that Toshiba has decided that a 13-inch tablet (with a 1600x900 display) will resonate with consumers. The aluminum-backed Excite series certainly looks better (the Thrive was rather clunky), has some high-end specs (but WiFi-only), but isn't cheap in the larger configurations! Android Ice Cream Sandwich (ICS) is standard on all three, and they each have NVIDIA's quad-core (or, more accurately, 4+1 core processing) Tegra 3 SoC. The Excite 7.7 weighs 13.4-ounces, the Excite 10 model weighs 1.32-pounds, and delivers 10-hours of battery life, and seven days of standby power, while the Excite 13 weighs 2.2-pounds and claims 13-hours of battery life, and the same standby power rating of seven days. Availability is May 6, 2012 for the Excite 10, and June 10, 2012 for the Excite 7.7 and the Excite 13. Prices vary according to the configuration, but oddly enough the Excite 10 is less expensive than the Excite 7.7, according to Toshiba's press release. A 13-inch tablet sounds a bit unwieldy to me, thoughts?